Potimarron will store well for a couple of months in a cool place. 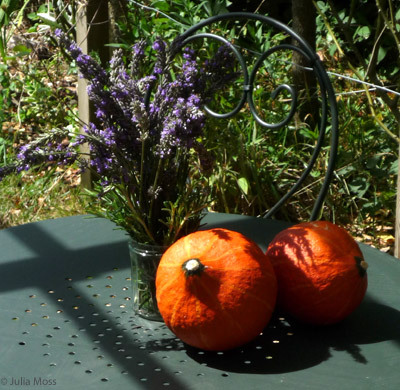 We love pumpkins and I find them exciting and rewarding to grow. We especially like the bright orange potimarron, whose hard flesh seems to melt into a soup made with nothing more than leeks sweetened in a little butter then simmered in a vegetable stock for about 20 minutes. Whizzed up into a thick orange cream, I add a swirl of crème frâiche and then all it needs is a hunk of fresh bread and butter. Its bigger sibling, the potiron, promises fine things but I find it too watery for a soup and therefore best roasted among some winter roots with garlic and rosemary. I’ve planted them both along with a newcomer called Musquée de Provence after inspiration by Nigel Slater in his book ‘Tender’ , and the ever-so-useful butternut squash. Nearly a month ahead, the roses are already at their best. Each flower is appreciated during our daily tours of the garden, the most perfect bud commented upon and closely observed as if it were the first and only one we’ll see. Congratulating ourselves on how at least we did the right thing in one area, we’ll be equally regretful at not having done something differently elsewhere. A few short showers of heavy rain later, plants go into overdrive, putting on several inches in a matter of hours and producing buds and flowers overnight. What an extraordinary time. Author Julia MossPosted on Tuesday, May 3, 2011 Monday, May 23, 2011 Categories Balandière, France, gardenTags Cooking, France, Fruit and Vegetable, Nigel Slater, pumpkin soup recipe, roses, Tomato, tomatoes, Vegetable varieties2 Comments on What’s round and juicy?